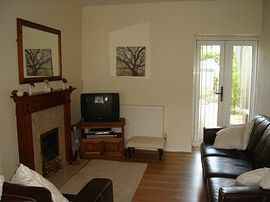 The house offers a peaceful setting to relax or to use as a base to access nearby cities such as Cardiff or Swansea. You can enjoy walking or cycling and enjoy the local forestry commission park, or travel to the nearby popular sites of the Afan Valley, Brecon Beacons, or the Black Mountains. The house is a recently developed end of terrace house in the centre of the small village of Cwmcarn. Cwmcarn can be found just 10 minutes from Junction 28 of the M4 or is a 30 minute bus ride from the main Newport train station. The house sleeps up to 4 people. It has a comfortable lounge and dining area and although it has full central heating it has a gas fire for those cold winter evenings. 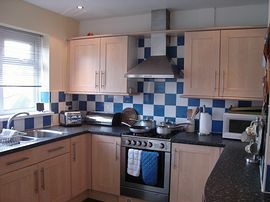 The kitchen is fully equipped with cooker, toaster, microwave and washing machine. There is also a modern bathroom with shower. The outside area is to the back of the house and is fully secured and has a secure lock up shed, hose for the bike, or water the garden if you like. 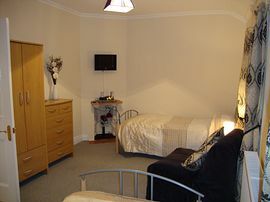 Our minimum rental is for two nights and prices start from £140 and includes free wifi. Good for mountain bikers & walkers with the Forest Drive. Peaceful location but in a small friendly village. All bedding and towels provided. 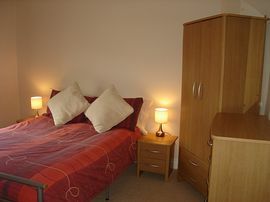 Spare towels and bedding also available. You can smoke outside in the garden. 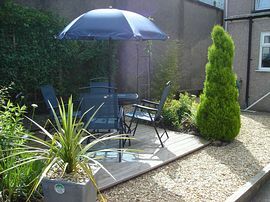 Secluded and secure back garden to the house with a decking area for sun chairs and bar-b-q area. Local Services: Cwmcarn Forest Drive is on the doorstep. The village also has a local grocers store, butchers, fish and chip shop open all day along with a few pubs. Nearest train station Crosskeys, 10 minutes walk away (passing pubs on the way). This train takes 30 minutes to Cardiff Central. Ivor Street - Turn right onto Ivor Street - turning is after school and before zebra crossing. Arrive at NP11 7EF,Cross Keys. Public Transport - Look at routes 151, X15, X16 From Newport and Cardiff traveline-cymru.org.uk. Minium stay is for 2 nights and the property sleeps up to 4 people. This includes the provision of bedding, linen and utilities such as gas and electricity (that is, there are no hidden metre charges). Open All Year (except Christmas holidays. Cyclists and Walkers Welcome Awards.